Whenever a freak accident occurs in the world of amusement parks, a common question always rises: "Are roller coasters safe?" More times than not, media tends to make things more dramatic than they really are. In rare cases, an event really did end with a tragic result (being the recent death on the New Texas Giant coaster at Six Flags Over Texas). Whenever any ride mishap makes the news, many people start to show concern in their safety. CGA Insider would like to assure you, the rider, that thrill rides and roller coasters are absolutely safe! Freak Accident: This is defined as a rare occurance. Because they are so rare, they instantly become the highlight subject on the evening news. A freak accident can be something as simple as when Superman Ultimate Flight at Six Flags Discovery Kingdom stopped at the ride's highest point last summer. The ride had actually not had enough momentum to make it through the course and balanced up top in place. Something along the lines of this is really just an inconvenience to park guests as they wait for evacuation (or in this case, being pushed back down the first tower, rolling safely into the station). know, his camera can become a dangerous projectile. Rider Caused Accident: Well, this really shouldn't be considered as an accident as rider's actions would be done on purpose. An example of this would be when some riders jumped out of Logger's Run approaching the drop. One fell to their death while another fell to safety on a platform. Other instances include riders disregarding the rules the park has in place...loose article policies are in place for a reason. Should an item break loose from one's grips, it instantly becomes a flying projectile! This projectile (whether it be a hat, pair of sunglasses, or electronic device) can seriously injure a rider. Unfortunately many riders don't think of this. Another example of a rider-caused mishap is trying to bypass height/size requirements. It really is not worth it to try to sneak your child (who is 2 inches short) on the park's newest thrill ride. Body size/proportions are another factor. Ride restraint systems were designed to fit a certain body size. Anything smaller or larger than what the manufacturer specifies can make the restraint systems ineffective. The ride manufacturers set these requirements for a reason. The parks enforce these regulations FOR YOUR SAFETY! Mechanical Malfunction: This can be something as simple as something mechanical causing the ride to stop. A well known example was when Great America's former Invertigo roller coaster experienced a mechanical failure when climbing up the lift in 2009. Riders were 'stranded' for several hours. Many people tend to freak out over a ride even doing something as simple as stopping on the lift (say, an e-stop for when somebody had their camera out). They then tend to express concern as they wait in line. Unfortunately, the Invertigo mishap frightened a lot of guests and many appeared to be leary of reriding it when it reopened knowing that it was stuck on the lift for several hours. Riders were completely safe however. Approximately 297 million guests visit the 400 U.S. amusement parks annually and take 1.7 billion safe rides. 61 of the 1,415 ride-related injuries, or less than 5 percent, required some form of overnight treatment at a hospital. Traffic-wise and automobile accidents, we are looking at 33,808 deaths. 1,415 injuries or 61 overnight hospital stays is a far cry from the over 30,000 vehicle fatalities. But how can we assure we're safe? Today's rides feature complex computer systems that WILL NOT allow a ride to dispatch unless ALL restraints are locked. Many rides use a ratcheting system for its lapbars or over the shoulder restraints (OTSRs). Many other rides use hydraulic pressure as a means of keeping the restraint locked (in which Texas Giant currently has). Drop Tower at CGA also utilizes a hydraulic system. 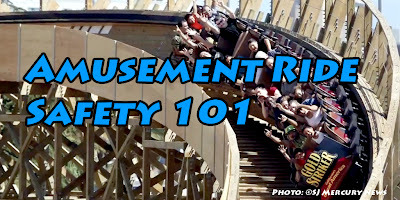 And if the locking restraints weren't enough, many rides feature a secondary (and sometimes a tertiary) 'redundancy' seatbelt should something ever go wrong. In the end, amusement park rides are quite safe. One faces more of a risk slipping and hurting themselves in the shower, playing a sport, riding a bike, walking across the street, or even taking a drink of water (Many have had times where their drink went down the wrong way and had a coughing fit, much like myself). With all of this said, go out and visit your local amusement park and enjoy some rides! The new amusement are designed to provide rider the best safety measures but still rider must follow these tips to avoid any serious accident.